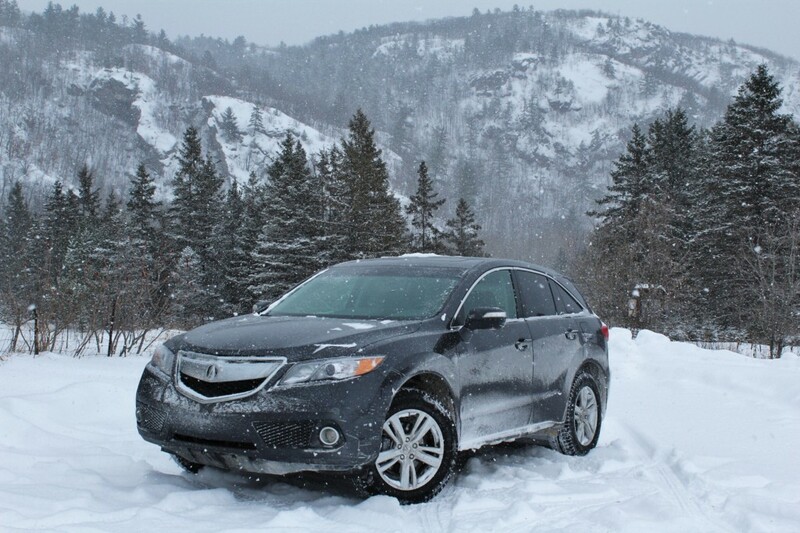 The coldest February on record didn’t deter the 2015 Acura RDX from seeking snowy adventure. Acura must have figured luxury crossover buyers didn’t like weighing equipment options, so it made everything standard on its smallest utility vehicle. 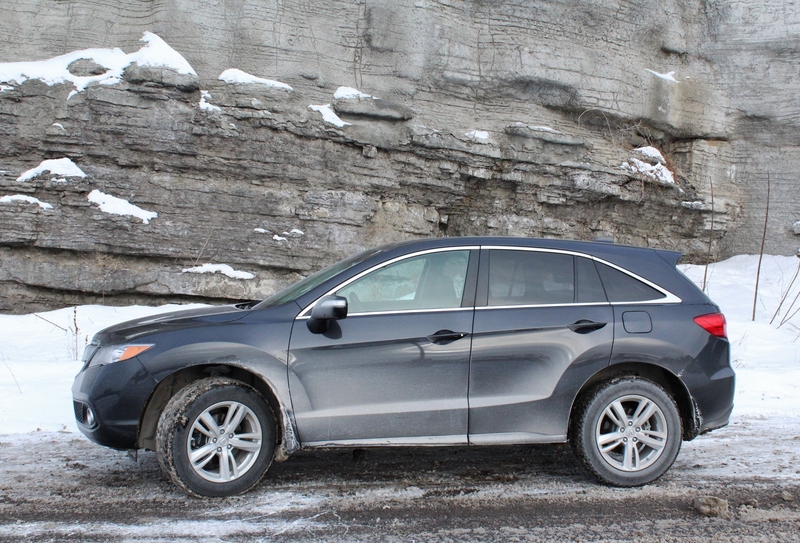 The Acura RDX comes in one trim level, with one available drivetrain and just a single available upgrade – a technology package that our tester came with. Competing in a crowded market, the folks at Acura must have felt it was better to put everything in one basket to sweeten the package. 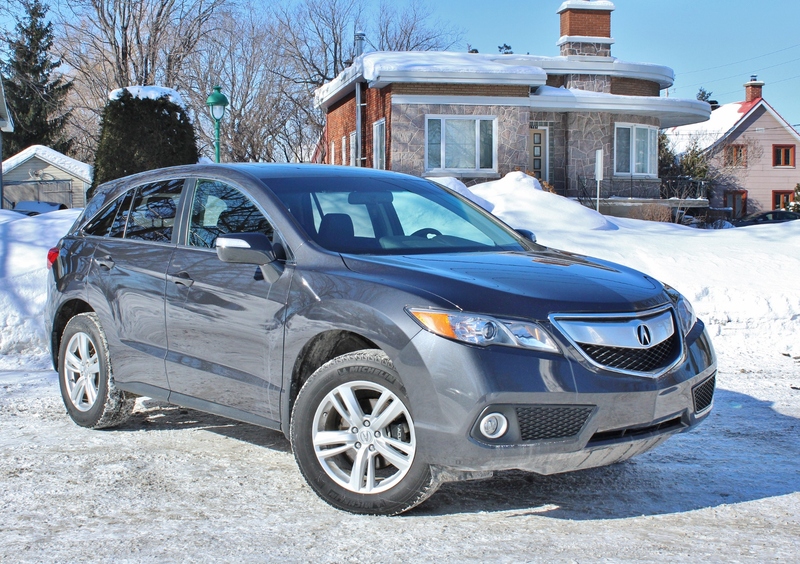 Introduced for the 2007 model year, the second generation of the Acura RDX appeared in 2013 with a new look and a simplified drivetrain. 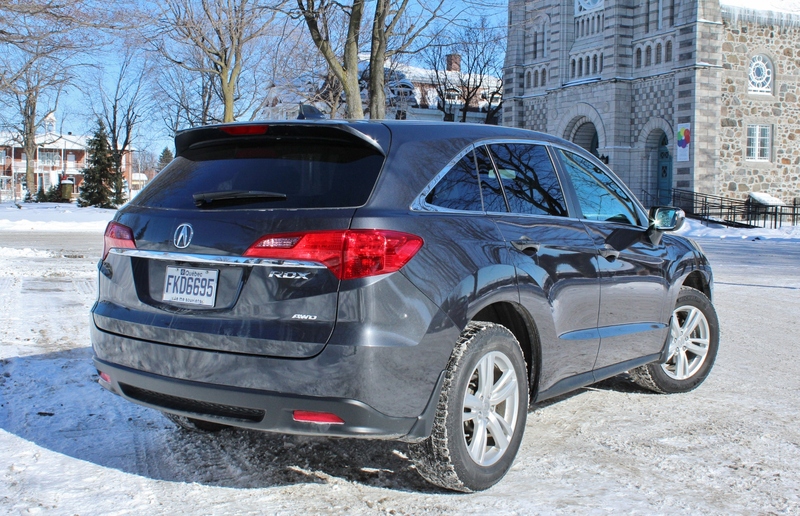 The Acura RDX shares many of the styling cues of its larger brother, the MDX. A strong, Honda-sourced 3.5-litre V-6 replaced the high-tech turbo four of the previous generation, while a simpler AWD system replaced Acura’s previous SH-AWD system. This changed reduced the vehicle’s weight by about 130 pounds, while boosting gas mileage considerably. The previous 5-speed automatic transmission gained an extra gear, which can take credit for the large bump in highway mileage. The RDX’s styling can best be described as ‘safe’, with the marque’s corporate ‘shield’ grille offering brightwork up front and an angular body behind it. With a somewhat wedge-shaped nose and angular body panels, its profile is similar to that of its larger stablemate, the MDX. Both chose to forgo the coupe-like rooflines that are making inroads into the utility market. While it doesn’t swivel heads like the edgier crossovers on the market, the design does enhance interior volume and helps cater to those not looking to make an overt design statement. After all, the RDX is a luxury vehicle first and foremost – meaning it’s reserved on the outside, but will coddle you on the inside. 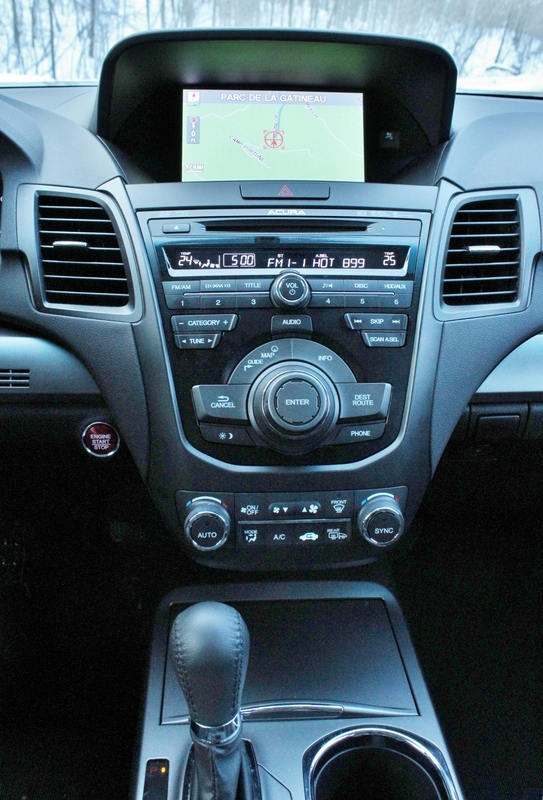 The dated, button-heavy centre stack in the 2015 RDX will be mostly gone come 2016. The RDX is something of a hot rod amongst its peers, coming equipped solely with a 3.5-litre i-VTEC V-6 making 273 horsepower and 251 foot-pounds of torque. Many compact crossover SUVs these days come with standard four-cylinder engines, and an increasing number are doing away with a six-cylinder option altogether. The steering wheel mounted paddle shifters for the 6-speed automatic aren’t likely to see much use in regular driving – the shifts are so delayed as to make the feature almost pointless – though they would assist in holding gears while climbing a steep grade. Up front, there’s ample legroom, a cavernous console with numerous plug-in points, and standard Bluetooth hands-free calling. Our tester’s optional technology package added Acura’s navigation system (with voice recognition and 8-inch display screen), as well as a 10-speaker, 410-watt premium audio system. A dual-zone climate control system and power tailgate were also included in the package. Leather comes standard in the RDX, and the 8-way power driver’s seat features adjustable lumbar support. Both front seats are heated, which is a welcome necessity during a winter as cold as this one. Creature comforts and effortless power are the hallmarks of this right-sized Acura. A leather-wrapped steering wheel and shift knob are par for the course, and look nice, but the dated-looking dash could use a lot of work. The centre stack – a mass of hard black plastic – is button-heavy and confusing, with climate control, clock, and stereo information crowded into an inch-high display strip. The contrast between the dashboard’s hard and soft plastics isn’t appealing to the eye, and the quality of both materials don’t seem worthy of this class of vehicle. Acura would be wise to adopt the modern, less cluttered dash layout of the larger MDX for use in the RDX. A saving grace for the dash situation is the locating of stereo, Bluetooth and other controls on the steering wheel. In the rear, a healthy 26.1 cubic feet (739 litres) of cargo volume is available behind the second row seats, which can fold flat and feature a 60/40 folding seatback. Rear legroom is generous at 973 millimetres. Excellent front and rear seat legroom makes the RDX a nice venue to spend time. The RDX isn’t particularly heavy for a crossover, at just over 3,800 pounds, which makes for effortless acceleration and passing. The V-6 emits a throaty growl under heavy throttle, which is pleasing for the horsepower enthusiast, yet seems almost at odds with the vehicle’s conservative image. The steering isn’t heavy in the RDX (that wouldn’t be fitting for a luxury vehicle, after all) but it is precise, making the RDX feel nimble and balanced, despite having a suspension geared towards a softer ride. With cracks, potholes and frost heaves littering the roads during this colder than average winter, a softer suspension – coupled with meaty P235/60 R18 tires – helped soak up the minor road imperfections and offset the worst ones. At highway speeds, some road and wind noise intruded into the cabin, but not excessively. 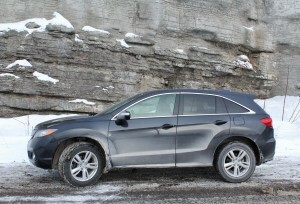 Despite the poor road conditions and frigid temperatures encountered during the test period, the RDX’s body and fittings exhibited no squeaks or rattles, which helped reinforce the vehicle’s sense of quality. The Acura RDX comes standard with full-time all-wheel-drive. 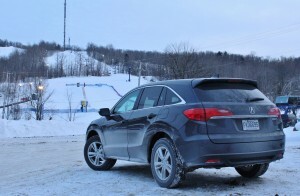 In heavy snow, and on partially covered highways, the RDX’s all-wheel-drive system helped maintain the vehicle’s composure, with the rear axle kicking in as needed. For the most past, the system stays in the background, waiting to ride to the rescue of wheel slip. To counter momentum, four-wheel disc brakes (ventilated on the front) did a good job of stopping the RDX quickly, and the pedal had a consistently heavy feel. Some brakes are mushy in the upper level of travel then come on too strong, causing the diver to reflexively back off. There was none of that with the RDX. With a big V-6 under the hood, the RDX’s doesn’t set records for being frugal on gas. Acura lists the RDX’s city fuel consumption at 12.1 litres/100 km, while highway driving nets 8.7 litres/100 km. 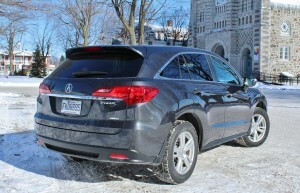 A jaunt of about 120 km on rural two and four-lane roadways returned 9.0 litres/100 km, while outfitted with snow tires. City mileage averaged factory estimates. Retailing at $41,690, the Acura RDX sees competition from the likes of the Lexus NX, which features edgier styling and retails for almost the same price, but doesn’t offer a V-6 engine. The Lincoln MKC, another turbo four-only model, undercuts the price by a couple of grand. A suspension tuned for comfort didn’t dampen the RDX’s sporty drivetrain and precise steering. Despite the new competition, annual sales of the second generation RDX far exceed those of the first generation, showing that Acura’s strategy for the model is clearly paying off. With its abundant space and standard features, the Acura RDX capitalizes on themes of comfort and convenience – a plan that seems to have served it well. With the second generation RDX now its third year on the market, and with some styling elements starting to show their age, Acura decided to freshen up the model for the 2016 model year. A facelifted RDX was recently unveiled at the Chicago International Auto Show, sporting an updated look and minor equipment tweaks. A more chiseled front end, restyled headlights and taillights, and a simplified dash layout are among the most notable changes. The 2016 Acura RDX is expected to go on sale in the spring of this year. This entry was posted in Test drives and tagged Acura, Acura MDX, Acura RDX, Honda on March 11, 2015 by Steph Willems.